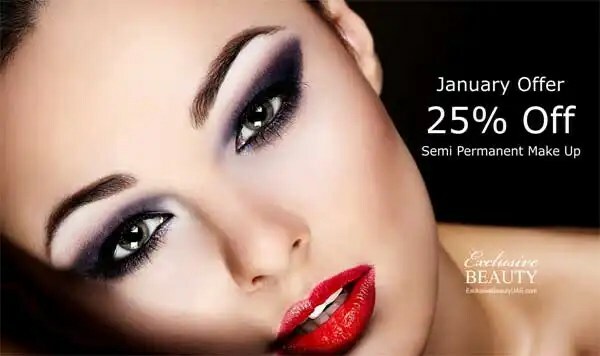 Exclusive Beauty are offering an amazing offer on their industry leading Semi Permanent Makeup treatments – 25% off our most popular treatments for the month of January. Sound too good to be true? Simple go to Exclusive Beauty’s website HERE and click on the 25% offer advertisement, fill out the contact us form with your name, email, mobile number and which treatment you are interested in and that’s it! Then one of our representatives will contact you to arrange an appointment. Appointments are booked in 1 hour slots, the first 15 minutes is a consultation where you can decide to go-ahead with the treatment or not. If you decide not to then the consultation, as always, is free. A link to contact form can also be found HERE. Can’t make an appointment in January? Simply fill out the form and submit to us in January. You can then specify an appointment in February and the discount will apply. We must receive the contact form in January and you must agree an appointment time when we call for the January – Semi Permanent Makeup Deals will apply. Top ups must be performed 4-6 weeks after initial treatment. Exclusive Beauty’s January offer, part of our Semi Permanent Makeup Deals. To qualify for the 25% discount the CONTACT FORM must be filled out and sent to us. A representative will then contact you either via email or phone to arrange an appointment time. Exclusive Beauty, Experts in Semi Permanent Make Up and Medical Micropigmentation. Exclusive Beauty was established in 2009 by Candice Watson who is an expert at micropigmentation and semi permanent make up.